Get a sense of the local culture at Temples of Uxmal and Zona Arqueologica Uxmal. 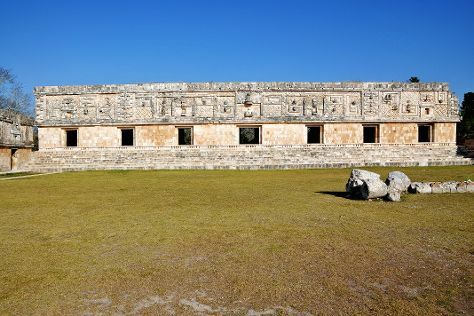 Deepen your sense of the past at sights like Chichen Itza and Mayapan Mayan Ruins. Change things up with these side-trips from Merida: Chichen Itza (El Castillo & Cenote Ik kil), Uxmal (in Muna) and El Atrio del Convento de Izamal (in Izamal). There's still lots to do: enjoy the sand and surf at Punta Soliman Beach, contemplate in the serene atmosphere at Merida Cathedral, admire the striking features of Plaza Grande, and delve into the distant past at Dzibilchaltún. To see ratings, photos, more things to do, and tourist information, use the Merida itinerary planner. If you are flying in from United States, the closest major airport is Licenciado Manuel Crescencio Rejon Int Airport. In December in Merida, expect temperatures between 87°F during the day and 68°F at night. Finish your sightseeing early on the 11th (Mon) to allow enough time to travel back home.